By Barry Hussein, IOWA – Moving his arm and stretching it away from his body, 2012 U.S. Presidential candidate Newt Gingrich reached out to conservatives this week, touching many in places they hadn’t been touched before. “There’s this place, on the body – I had to look it up in an encyclopedia,” ejaculated Mintner Rowe, 56, a man dressed in an inexpensive dark brown suit. “That’s where Gingrich applied the cocoa body oil,” he went on. Gingrich’s campaign spokesperson Baron Shack, 23, confirmed Newt will be randomly poking, caressing, stroking and goosing conservatives whenever he gets the chance. “If you’re not up for it, I’d suggest standing a few steps back from the candidate,” Shack advised. “If you’re sitting next to him on a bus or a plane, you could move one seat over,” he went on. What if I’m stuck next to him on a crowded elevator? Is Mr. Gingrich also planning to reach out to liberals? How ’bout those guys who dress like they’re in Gap ads? Unnamed sources within the Gingrich camp say the issue has divided advisors, with some insisting anyone who dresses smartly and spends a lot on their jeans is a de facto conservative, and others, perhaps predictably, saying, no-no-no-no, but wait, hold on a minute here, bro’, my nephew Chas wears those Julian Assange jeans and he’s down their at that Occupy Wall Street thingy, and therefore, we’ll just never, ever know who’s on our side or not. “Yes, there is this division within Gingrich’s campaign – over how to even deal with the whole idea of what is a conservative, really,” ejaculated Lauren Jauet, 46, who is writing a book about conservatives, `What Is the Whole Idea of What is a Conservative, Really?`. OK, so whut kinda ideas people be talkin’ ’bout? Maybe they should just have Newt touch everybody first and figure that out later. 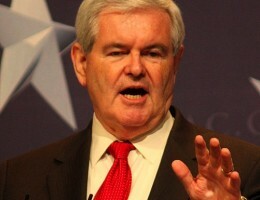 Isn’t Newt too old to be President? That’s right. And the Queen Mum is older, too. Huh. Where can I vote for Newt Gingrich? That’s too bad. I just wanted this story to have a happy ending. This entry was posted in Presidential Daily Brief. Bookmark the permalink. The rest are too young. where can i go get in line to have newt touch my body? the article doesn’t provide real, hearty info your readers can apply to their endless lives. make it right.